... and they both come from 'good' families! 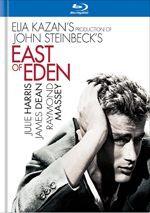 Teen Jimmy Stark (James Dean) struggles to find an identity in the face of a nagging mother and a spineless father, getting into knife fights and other trouble. After a tragic, lethal car race, he meets up with generally good girl Judy (Natalie Wood) and geeky, needy Plato (Sal Mineo) and the three form a surrogate family of sorts. Of course, the bad boys are still after them, and the evening ends in tragedy. For many of us who weren’t born until long after the Fifties ended, we’ve been stuck with a Happy Days view of the decade. It always has been portrayed as a very clean-cut, innocent time with none of the angst or rebellion apparent during the more turbulent Sixties. As such, it comes as a mild surprise to find movies like Rebel Without a Cause which demonstrate that not all was well at the time. 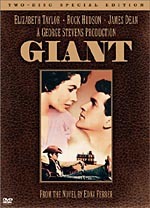 The movie focuses on Jim Stark (James Dean), a troubled teen whose activities have forced his family to bop from town to town. At the start of the film, he’s drunk and disorderly in his new burg, and when the cops haul him in, he briefly meets two folks who will soon become prominent in his life: Judy (Natalie Wood) and Plato (Sal Mineo). Both have their own issues, though it’s quickly made clear that Plato is easily the screwiest of the bunch. The film doesn’t really feature much of a story, but it focuses on Jim’s problems as he attempts to integrate into a new school and town. Though parts of the movie seem pretty dated, I was surprised at how timeless this look at troubled youth really was. The concerns that confronted Jim and the others remain for kids of our age; although we tend to look at the Fifties as a time of banal innocence, it’s clear that many of the same issues occurred back then, and Rebel effectively illustrates these concerns. Somewhat surprisingly - given the Father Knows Best close-knit aura of the decade - virtually all of the kids’ problems relate to their parents. Jim lacks a strong male role model; his dad (Jim Backus) is present in the home but he’s clearly dominated by his wife (Ann Doran) and it requires severe concerns on the part of Jim to make Mr. Stark finally take a stand. The family problems faced by Judy are less clear, but it’s obvious they exist, while Plato’s issues relate to the absence of family; his parents are never around and he’s left to the care of a nanny (Marietta Canty). As seems to be typical of many teen-oriented films of the era, the kids are the ones who are self-aware and on top of things while the adults are clueless and self-absorbed; a similar theme appeared even in The Blob. I don’t know how realistic this attitude is, but it adds to the unexpected flavor of the period’s movies. It’s another aspect of Fifties flicks that I didn’t really expect, and it adds an unusual tone to the picture as the adults consistently ruin the progress achieved by the kids. Despite some dated aspects, Rebel works because it does seem generally timeless, and the acting helps make it more convincing. Even more so than with Marilyn Monroe, Dean has become such an icon that it can be difficult to view him as an actor. Folks of my generation have much greater acquaintance with the poster idol than with the performer. In any case, Dean offers a strong performance as Jim, who he makes believably tough and vulnerable at the same time. Dean’s work helps carry the film and makes it more memorable and convincing than it otherwise might have been, and the other actors also add good work. My only problem with a character related to Plato, mainly due to a “hot button” issue for me. Potential spoiler in the upcoming opinion: early in the film, we learn that Plato has killed some puppies. Sorry, but that action immediately made it impossible for me to have any sympathy for the character. I adore dogs and can’t stand to learn of their mistreatment. I understand that Plato’s actions were the result of his pathology, but I just can’t excuse puppy-killing. The boy got what he deserved! Despite that aspect of the film, I still found Rebel Without A Cause to be a “classic” that actually deserves its praise. The movie provided a fairly deep and convincing exploration of “youth gone wrong” and it succeeded due to some good acting and the timelessness of its subject. Rebel Without a Cause appears in an aspect ratio of approximately 2.55:1 on this Blu-ray Disc. Across the board, this became a pleasing presentation. Sharpness tended to be fine. At times the image could be a little soft, and some edge haloes resulted from the movie’s photographic techniques. Overall, however, I thought delineation looked solid. No problems with jagged edges or shimmering occurred, and print flaws were a non-factor in this clean presentation. I also didn't sense any prominent use of digital noise reduction. Colors seemed strong. The hues displayed good definition, and often were really positive. Blacks were dark and tight, and shadows worked well too, as the low-light shots came across fine. Even with the mild softness, I thought this was a nice transfer that held up well. The film’s remastered DTS-HD MA 5.1 soundtrack seemed better than average for the era. The soundfield didn’t do a lot to spread the audio across the speakers, but the score benefited from the extra channels. Throughout the film, the music displayed nice stereo separation and imaging. Some effects also appeared from the right and left side speakers at times, and they even showed some mildly-positive panning. The surrounds seemed largely inactive. They provided light reinforcement of the music but virtually nothing else. Ultimately, the soundfield appeared unspectacular but was appropriate for a remix such as this. Audio quality sounded fine for material of this age. Dialogue could be slightly thin and wan but displayed no signs of edginess or problems related to intelligibility. I should note that Rebel suffered from some terrible looping, as many lines obviously came from the studio. Effects were similarly thin but came across as acceptably realistic, and even louder sounds showed no distortion. Music lacked much brightness, but the score seemed reasonably clear and distinct, and it showed fairly nice low end at times. The track lacked any noticeable hiss or noise. As a whole, the audio for Rebel was nothing extraordinary but it seemed good for its age. How did this Blu-ray compare to the SE from 2005? Audio came across as a bit smoother and more robust, while visuals appeared tighter and better defined. This was a good step up in quality compared to the DVD. The Blu-ray duplicates the DVD’s extras. We get the movie’s trailer as well as an audio commentary from biographer Douglas L. Rathgeb. He provides a running, screen-specific track that usually offers some good information. Rathgeb goes into notes about the cast and filmmakers, locations and visual design, the script and changes made to it, reshoots and the film’s original black and white scenes, improvisations, problems with the Production Code, issues connected to Dean’s death, and general production notes. At his best, Rathgeb gets into the nitty-gritty of the film well. He digs into a lot of nice production elements and gives us a decent overview of things. Unfortunately, the track drags at times due to some dead air, and Rathgeb also tends to simply narrate the flick as it progresses. Nonetheless, there’s enough good content to make this commentary worthwhile. Called Rebel Without a Cause: Defiant Innocents, this 36-minute and 30-second piece mixes movie clips, archival materials, and remarks from Rathgeb, James Dean’s friend William Bast, screenwriter Stewart Stern, Natalie Wood’s double Faye Nuell, and actors Beverly Long, Frank Mazzola, Corey Allen, Jack Grinnage, Dennis Hopper and Steffi Sidney. 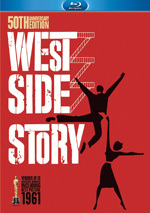 The program looks at the film’s connection to society of the early Fifties, the origins of the film and script development, various story topics, casting, characters, and the actors’ interactions, problems using Cinemascope and visual concepts, changing from black and white to color, shooting various sequences, improvisation and working with director Nicholas Ray, and the movie’s legacy. The best parts of the show deal with the evolution of the script, as we get terrific insight into the flick’s background. Stern proves especially revealing when he notes the ways that his real life influenced the story and other influences. Plenty more valuable moments appear as well, and those flesh out “Innocents” to create a very informative and entertaining look at the production. A “vintage documentary” entitled James Dean Remembered comes next. Created in 1974, it fills one hour, six minutes and 22 seconds with narration by Peter Lawford and comments from Sammy Davis Jr., Natalie Wood, Sal Mineo, Leonard Rosenman, and Steve Allen. “Remembered” covers Dean’s life. It alternates standard biographical notes with memories of Dean from the folks involved. Along with many movie clips, the latter elements dominate; most of the show focuses on the remarks made by the folks who knew him. At times these can become insightful. In particular, Rosenman lets us know a lot about the inner Dean. Some of the other statements seem quite odd, such as Mineo’s admission that he tried to use supernatural methods to contact Dean from beyond the grave! The biographical side of things gets only minor discussion, and that creates a weakness to “Remembered”. Too many of the celebrity remarks about Dean remain superficial. Sure, it’s good to get personal observations about the actor, but these tend to stay on the surface and don’t really give us a terrific feel for the man. Highlights come from some early TV appearances by Dean, though we see too little of those and too much from his movies. The show ends up as a mostly unsatisfying mix of history and anecdotes. New to the Blu-ray we hear from the legendary actor in the 10-minute, 31-second Dennis Hopper: Memories from the Warner Lot. Hopper discusses how he came to WB in the early 1950s as well as aspects of his career there. Hopper doesn’t tell us a ton about Rebel but he gives us some good stories in this enjoyable piece. 16 Additional Scenes run a total of 23 minutes and 51 seconds. These come without audio, which limits their usefulness. Granted, a lot of them seem to fall closer to the category of “outtake” than of “deleted scene”, and they probably wouldn’t be very interesting with or without sound. Nonetheless, some appear more intriguing, and it becomes difficult to get much from those silent clips. Couldn’t the disc have used subtitles to flesh out the sequences? Next we get three segments from the Warner Bros. Presents TV series. These include some general information about Rebel plus interviews with a few principals. The first one talks with Natalie Wood and lasts seven minutes and 57 seconds, while the second features Jim Backus and runs five minutes and 47 seconds. The last one includes Dean and goes for seven minutes and 44 seconds. Don’t mistake these for continual interviews. Especially in the case of the Wood piece, much of the footage looks at other areas of the film; the interviews can be quite minor. The Backus and Dean segments are longer, however, and in the case of the latter, quite spooky; I’ll leave the details for you to discover yourself, but Dean’s comments clearly enter the territory of “creepy” when viewed in retrospect. One note: the pre-interview parts of both the Backus and Dean clips are virtually identical; only the conversations themselves differ. In any case, I liked these pieces and thought they offered a very interesting look at the movie. Finally, the disc includes Screen Tests and Wardrobe Tests. The former lasts six minutes, 27 seconds and focuses on the interaction among Dean, Wood and Mineo. The “Wardrobe Tests” go for five minutes, five seconds. These show Dean and Corey Allen along with a mix of the gang members. We viewed excerpts from both during the “Defiant Innocents” documentary, but it’s good to get extended segments here. Although it probably should seem pathetically dated, Rebel Without A Cause generally holds up well despite its age. The movie provides a solid look at the era’s youth culture and the problems faced by teens. Largely due to some excellent performances, the movie remains moving and convincing many decades later. The Blu-ray delivers good picture and audio along with a nice selection of bonus materials. This becomes a strong release for a classic film. 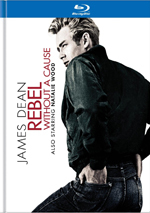 Note that Rebel Without a Cause can be found on its own or as part of a three-film “James Dean Ultimate Collector’s Edition”. This also includes East of Eden, Giant, three bonus discs and additional paper materials. The “UCE” retails for $99.98 which makes it a good deal for Dean fans who want to own all three movies.